Composed of contributions from top experts, Microelectronics to Nanoelectronics: Materials, Devices and Manufacturability offers a detailed overview of important recent scientific and technological developments in the rapidly evolving nanoelectronics arena. Under the editorial guidance and technical expertise of noted materials scientist Anupama B. Kaul of California Institute of Technology's Jet Propulsion Lab, this book captures the ascent of microelectronics into the nanoscale realm. It addresses a wide variety of important scientific and technological issues in nanoelectronics research and development. The book also showcases some key application areas of micro-electro-mechanical-systems (MEMS) that have reached the commercial realm. Capitalizing on Dr. Kaul's considerable technical experience with micro- and nanotechnologies and her extensive research in prestigious academic and industrial labs, the book offers a fresh perspective on application-driven research in micro- and nanoelectronics, including MEMS. Chapters explore how rapid developments in this area are transitioning from the lab to the market, where new and exciting materials, devices, and manufacturing technologies are revolutionizing the electronics industry. Although many micro- and nanotechnologies still face major scientific and technological challenges and remain within the realm of academic research labs, rapid advances in this area have led to the recent emergence of new applications and markets. This handbook encapsulates that exciting recent progress by providing high-quality content contributed by international experts from academia, leading industrial institutions-such as Hewlett-Packard-and government laboratories including the U.S. Department of Energy's Sandia National Laboratory. Offering something for everyone, from students to scientists to entrepreneurs, this book showcases the broad spectrum of cutting-edge technologies that show significant promise for electronics and related applications in which nanotechnology plays a key role. 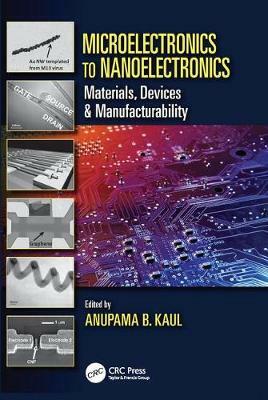 "It is a pleasure to write the foreword for this book because of its timeliness, because of its excellent breadth and depth of coverage, which captures most key facets of the field, and because its editor, Dr. Anupama Kaul, is an esteemed collaborator of mine in MEMS and nanotechnologies research. Indeed, her expertise and excellent reputation in the field derives from her extensive work on the development of carbon nanotubes (CNTs)- and carbon nanofibers (CNFs)-based devices conducted at the Jet Propulsion Laboratory, California Institute of Technology. ... she is uniquely qualified to edit such an ambitious piece of work, gathering contributions from a stellar roster of top researchers in the field. ... the book marks a milestone by capturing the current status of research and development. Therefore, it is of extreme value to both established researchers as well as newcomers who aim at discovering and exploiting the vast space available at the bottom!" "Excellent topics covering fundamental limits in scaling down silicon based semiconductors to recent promises in nanowire based devices. ... Overall, this book would be an excellent choice for readers ranging from engineering students to the experts in the field." "... Dr. Kaul has done an excellent job covering the field objectively. The collection touches on very fundamental work in this field but also represents examples of how the evolution from microelectronics to nanoelectronics have resulted in successful products and innovations. As I state above, the contents (and authors) provide an excellent cross section of this field." "Overall, this is an excellent reference book for researchers and educators in the areas of microelectronics and nanoelectronics. ... More importantly, this book emphasizes on manufacturability, which is a distinction from other books on similar topics which mostly discuss theoretical principles." "... provides comprehensive knowledge on nanoelectronics and the relatred materials processing and manufacturing technology. It also gives a nice introduction to nanoscale device fabrication. In addition, the latest advances and research results are included. The book has a nice balance between introducing fundamentals of nanoscale device fabrication and the in-depth knowledge in the field of nanomanufacturing. a nice reference for both researchers in the field and students who want to learn more ..."